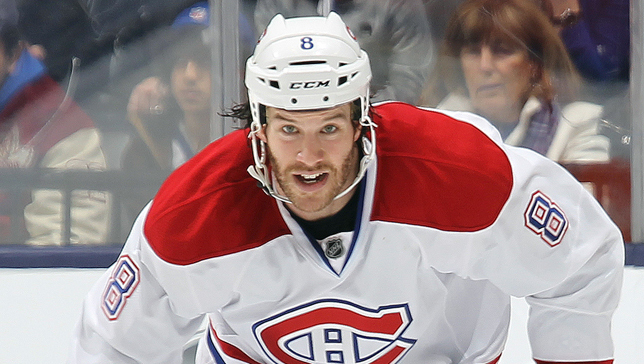 If you asked me who my favourite Habs players are, it would take me a few names to get to Brandon Prust, but he easily makes top five: steady, dependable, ever present. He has always had a special place in my heart. You see, I became a Habs fan in large part because my friend Jasmine told me stories about the team a few years back. Some of the stories she told me were about Subban’s sizzle, Pacioretty’s miraculous ability to heal, the Gallys’ antics, the brick wall that is Carey Price, but the best ones were always about the lionhearted Brandon Prust. Had a bad day? Here’s a story about this hockey player who looks out for our rookies. School getting you down? How about the time when this guy on the Habs went to war for his teammates. Family drama? Look at one of the veterans on our team yelling and laughing and celebrating harder than anyone because one of the kids scored their first goal. Oh by the way, he has fantastic style, a mane of hair and a lethal pair of fists. Now, I’m a medievalist. I have my BA and MA in Medieval Studies. Heroes and warriors are in my soul. Several friends and I used to joke that hockey is where the knights in armour went, so is it really any wonder that Jasmine’s stories about a fighter with a heart of gold and a fair lady were the ones that caught my imagination and made me pay more attention? Furthermore, Brandon Prust is a lot more than that as I eventually discovered, when my interest in hockey grew and deepened. Sadly, the mane is no more, but he’s a defensive powerhouse with a pair of wheels to match those fists. He’s a fighter who can score. He’ll be there for his team even when he’s got busted ribs and a busted shoulder, and when he’s healthy? He’s one of the guys you can watch go over the boards in the last seconds of a one goal game in your own zone, when the other team’s pulled their goalie, and not feel like hiding behind the couch. I’ve seen it happen. Maybe I’m biased, and maybe I’ve not seen a whole lot of fights in my short time as a hockey fan, but I don’t know where I’ve seen another fighter like Prust. What he gives up to other guys in hight and weight and sheer brute force, he makes up for with patience and skill (and the aforementioned lethal pair of fists). I could write whole series’ worth of articles about the statistical evidence of Prust’s value to the team, or the heart and soul and hilarity we’ve been privileged to witness in 24CH episodes, duels, get-to-know-the-team videos and elsewhere. (I will never be over “You’ve got to f****ing squeak squeak” or the endless sniping back and forth with anyone (especially younger teammates) foolish enough – or lucky enough – to engage on twitter, and who’s gonna call people bug-eyed walruses now?) It’d take me a while to exhaust the subject. But it can also be summed up thusly: he clearly meant a lot to the team, and he meant a lot to me. It’s been a few weeks now since Brandon Prust was traded for Zach Kassian, and I finally have had some time to sit down and think about it. I can’t exactly say I was shocked, but I thought we’d have one more year to say good bye. Now I’m in quiet mourning. I hope he does really well in Vancouver, but he’s always going to be a Hab for me. Good bye Pigeon Leader. Good bye Lionheart. You will be sorely missed.